Contrary to the output of the past few months, Kneel Before Blog does review comics but the lack of evidence for that recently can be attributed to a lack of time on my part as well as anyone else. 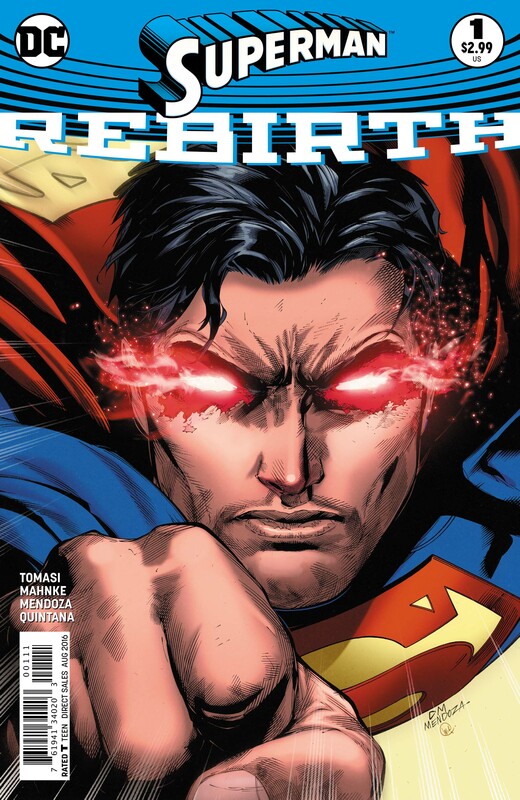 Now that the TV schedule has dried up a fair bit I’m very keen to revive this so I’m going to start with a new beginning of sorts in Superman Rebirth #1 written by Peter J. Tomasi and art by Jamie Mendoza and Doug Mahnke. A lot has happened to all of the characters in D.C. comics of late before leading up to their Rebirth event that should start a more accessible continuity for new readers. Recently Superman discovered he was dying after a string of complicated story threads that I won’t go into here because it could fill an entire confusing article all by itself. The important thing is that the Superman that has been starring in the comics since the New 52 came into being is now dead and has left a massive gap with his absence. As luck would have it there’s a Superman from another universe who has made a home in the reality we’re currently observing after his was destroyed. With him he brings his wife, an alternate Lois Lane and son Jonathan. With the native Superman now dead this makes him the only Man of Steel in town so logically he can come out of the shadows and fill those bright red boots. I should mention that his desire to help people overpowers the attempt to remain hidden so he has been using his powers to protect people in secret. All this talk of alternate universes and the destruction of them probably seems overly complicated if you’re not hugely into this medium but it falls into the background of this particular issue. Readers picking up this comic are encouraged to accept that there’s a background to all of this that shouldn’t be ignored as such but isn’t all that important right now. In fact, I’m sure stories like this are what the phrase “just go with it!” was invented for. From a structural point of view this issue is almost entirely transitional. It starts off with the problem of Superman being dead and the world having to move on without him and seeks to solve that through the course of the story. It’s simple, easy to follow and I would say that people won’t have a problem picking this up and being able to roll with it. There’s always the risk that transitional stories are uninteresting because they tend to summarise what came before while teasing what is to come next but this definitely doesn’t fall into that trap as it keeps the narrative entirely focused on the narrative. All that really happens is that Superman and Lana Lang have a conversation where they try to contextualise what this loss means for them. It’s a story about grief as well as the bonds of friendship and this makes it really compelling on its own. Lana’s objective here is to exhume Superman’s remains and take them back to Smallville so that he can be buried beside his parents. At his core Superman is a simple man with broad Midwestern values so having him laid to rest there makes a lot of sense in terms of honouring him. The whole state funeral thing isn’t really Clark Kent’s style at least as far as Lana’s concerned. It’s really powerful to think that she wants to honour him this way and it shows that he is thought of differently to different people. The living Superman in this story counters this nicely. He sees his counterpart as a hero and a symbol of the people who should be honoured with a large memorial. Interestingly it isn’t how he sees himself but it shows that the inspiration that Superman brings to people even extends to other versions of himself. He feels different to the previous Superman as he is older and wiser which gives him a different perspective on things. His speech pattern is very deliberate as befits someone so experienced. Both Superman and Lana have very different expectations at the beginning of this. Lana has accepted that he’s dead and wants to move on with her life after honouring him the only way she knows where Superman expects this death to be a temporary measure. He recalls his lethal fight with Doomsday that he was able to eventually come back from so he sees no reason that his counterpart won’t do the same thing. Eventually he accepts that it isn’t going to happen but it’s good to see the issue addressed directly since death is well known to be a temporary measure in comics. I dare say that the dead Superman will be brought back to life at some point but for now he has left a huge gap that needs to be filled. Superman and Lana’s interaction is really well written. Lana objectively knows that this isn’t the man she knew but it’s clear that he reminds her of him and that makes things difficult for her. She slowly comes to accept him once hearing his story but she is still somewhat wary of him by the end of the story. It is something that will pass but the tension is very real. At this point she is still grieving so it all feels very real. 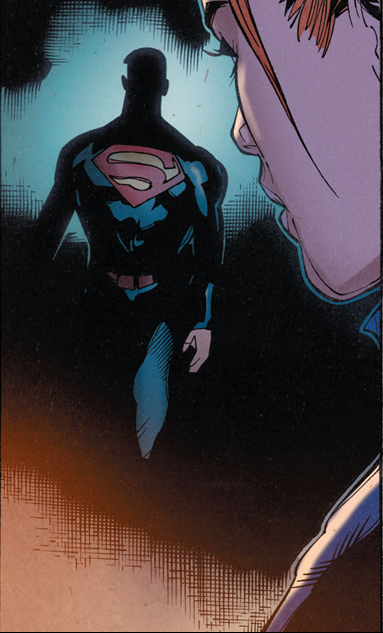 The emotional high point of the issue is when Lana takes him to the Fortress of Solitude and he realises that the device that helped restore him to life over in his universe doesn’t exist here so it’s a very blunt way for him to accept that the Superman native to this Earth is gone forever. There’s a really powerful image in the fortress of Clark’s Kryptonian parents holding up Krypton and his human parents holding up Earth. This shows that he managed to find a balance between the two sides of himself before he died. 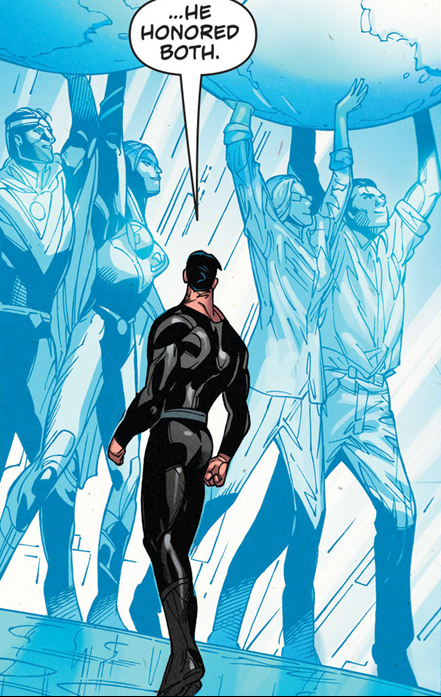 Superman acknowledges his counterpart’s humanity by creating a statue of him standing between the Kents. Considering this version has married Lois and had a son it makes sense that he would put more stock in his human side and therefore create his memorial from the human perspective. It’s a great tribute and allowed to linger for the right amount of time. The comic ends with the tease of him deciding to take the mantle as the next Superman and I look forward to seeing that cultivated in the follow up comics. It’s interesting that this comic would choose Lana for Superman to interact with rather than Lois. I think that this was a very deliberate choice as Lois might seem too close to his counterpart in a lot of ways. It would certainly be more awkward for him considering he’s married to a Lois Lane. By interacting with Lana he is able to get the perspective of someone who knew his other self well enough while still having some distance. It also has the added advantage of Lana being familiar to him from his world. The issue falls down slightly in the characterisation. I found the interactions to be really well written but I didn’t really get a sense of who Lana was. There’s some mention of her being an engineer but her relationship to the other Superman isn’t all that well defined in this issue. Maybe it doesn’t have to be since they have a rich history in previous comics but some kind of quick summary of how close they were would have helped here. It’s a small niggle, especially for me as I’ve read the extent of their relationship but it might be slightly off-putting to new readers. I don’t normally comment extensively on art because it’s far outside my area of expertise but I found it really striking in this issue. One of the contributors on this site, Gwen often talks about how important colour is in telling a story and I definitely think that applies here. The tone is set by everything being really dark in the beginning and getting lighter as the pages go on. Eventually everything is bright and warm which obviously suggests hope. There’s a clear contrast between the early parts of the comic and the later parts which shows loss and acceptance. There’s a great use of colour when Lana sees Superman for the first time and either the lighting or her own denial colours him red and blue instead of silver and black. His face is in shadow as well which confirms the power of the S symbol and what that stands for. In one tiny image it sums up exactly how Lana feels and having Superman appear almost ghostly really emphasises that loss. I also found the attention to detail in the art to be beautiful, particularly the flashbacks to Superman’s battle with Doomsday. An excellent comic and an exciting relaunch for Superman that should take him in interesting directions. The interaction between Lana and Superman was done really well and the sense of loss comes through powerfully. It doesn’t suffer the curse of a typical transitional story as it is ground in strong character beats. Lana comes across as a little underdeveloped for the purposes of this story but it doesn’t drag things down too much. The art is absolutely stunning with some great symbolism and striking attention to detail.